This hot water series with small size and lighter weight make it ideal for any cleaning chore. 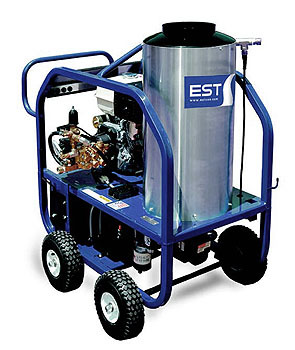 Standard features include tubular steel frame, stainless steel coil wrap, schedule 80 coil on GED model, 12 volt oil fired burners on GED model, 4 gallon burner fuel tank, four quick change color-coded nozzles, dual lance wand, chemical injector, pneumatic wheels, 50 foot of high pressure hose. Triplex plunger pump standard. Most models available in UL and 3 Phase. 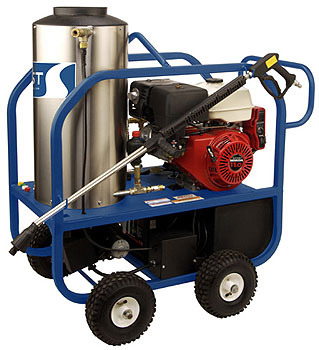 This series designed for rental and industrial use provides hot/cold cleaning power in a compact design. Standard features include tubular steel frame with lifting bar, stainless steel coil wrap, 8 gallon burner fuel tank, four quick change color-coded spray nozzles - 0°, 15°, 25° & 40°, 36” dual lance wand, chemical injector, pneumatic wheels, 50 ft. high pressure hose. Gas engine drive units feature 12 volt oil fired burners. Battery not included. Triplex plunger pump standard. Most models available in UL.